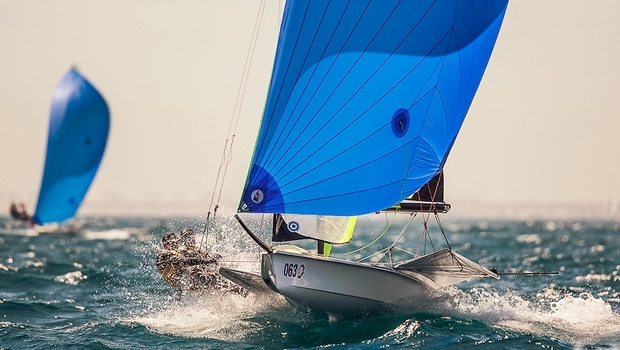 Racing got underway today at the 49er and 49erFX European Championships held out of the Barcelona International Sailing centre, close to where the sailing events for the 1992 Olympic Games were held. The 49erFX raced in the afternoon sessions of the day and Netherland’s emerging stars, Annemiek Bekkering and Annette Duetz, started their championship in the same dominant manner with which they took home the Princess Sofia Trophy in Palma de Majorca last week. They Dutch duo won all four races, but unlike in the 49er fleet, with only 18 boats per qualifying fleet, in the 49erFX the overall lead they were able to build up represented just a handful of points, with most of the top contenders still close behind. The yellow fleet of the 49er was first to get underway, kicking off the championship. All three London 2012 class medalists ended up in the same fleet and engaged with one another. Once again it was the London 2012 silver medalists Peter Burling and Blair Tuke from New Zealand who got the best start of all. The duo, unbeaten in 24 straight 49er regattas, passed 2008 gold medalist Jonas Warrer, sailing with his new crew CP Lubeck, on a swift hoist at the top mark in the first race, and then passed them again in the second race on outright downwind boat speed. In the third race of the day, it was London 2012 Gold medalists Nathan Outteridge and Iain Jensen who took a win, with Burling and Tuke close behind, unable to pass the Australian reigning Olympic champions who covered them as necessary to preserve the win. Racing was right-side favoured for most of the day, but there were enough opportunities on the left for teams to rescue beats when they got lucky. In fleets all trying to get to the right, starting skills were at a premium even though the open waters off Barcelona are unbounded. Bekking and Duetz used four different methods to get right, but never varied from their dominant strategy of using their speed to get the favored side. Farther back in the fleets were extremely busy with so much talent on display. In the Blue 49er fleet, Austrians Nico Delle Karth with Niko Resch, fresh off winning their silver medal at the 2016 World Championship, got off to a good start with a 1, 7, 2 to sit in second overall after the first night. In the battle of Britain, neither 49er contenders of Pink/Bithell or Fletcher/Sign could keep pace with the young chasers James Peters and Flynn Sterritt, who scored a 3, 3, 8 to comfortably sit in the top 10. While British trial details remain secret, it’s believed that a medal from Peters/Sterritt would stir up the selectors’ debate even more than the tight fight already requires. The forecast for the rest of the week in Barcelona is outstanding, with endless sun and wind on offer. It could get really windy for the final day of qualifying, so putting in solid performances on day two’s qualifying will be vital in case the third day gets blown out. The schedule for day 2 is for the 49erFX to start with three races followed by the 49er doing four races.